Chicken Little liked wandering about in the woods. 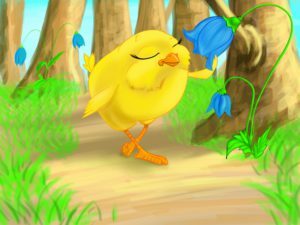 She liked looking at the trees and smelling the flowers. She loved listening to the birds singing. 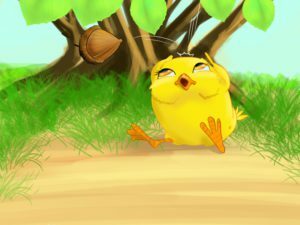 One day while she was walking an acorn fell from a tree, and hit the top of her little head. “Oh my, the sky is falling down! 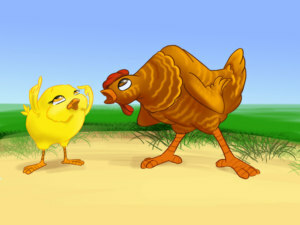 I must run and tell lion about it,” said Chicken Little, and began to run. She ran and ran until she met the hen. “Where are you going?” the hen asked. “Oh, Henny Penny, the sky is falling down and I am going to see lion and tell him all about it.” “How do you know that the sky's falling down?” Henny Penny asked. “It hit me on the head!” answered Chicken Little. “Let me come with you," said Henny Penny. So the two ran and ran until they met the duck. 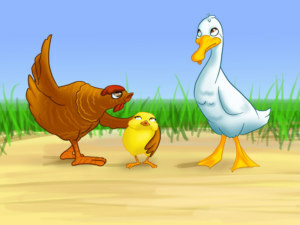 “The sky is falling down,” said Henny Penny,“so we're going to see the lion and tell him about it.” “How do you know that the sky's falling down?” Ducky Lucky asked. “It hit Chicken Little on the head,” said Henny Penny. “May I come with you?” asked Ducky Lucky. “Of course,”said Henny Penny. So all three of them ran on and on until they met the fox. “Where are you going?” asked the fox. 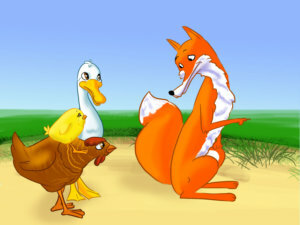 “The sky is falling down and we are going to see the lion and tell him all about it,” said Ducky Lucky. “Do you know where he lives?” asked the fox. “I don't,” said Chicken Little. “I don't,” said Henny Penny. “I don't,” said Ducky Lucky. “I do,” said the fox, “Come with me and I can show you the way.” He led them through the woods, on and on, until they reached his den. 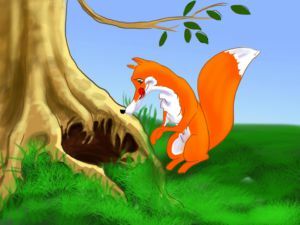 “Come right in,” said the fox. And they all went in, but they never came out again. You should never trust a stranger.